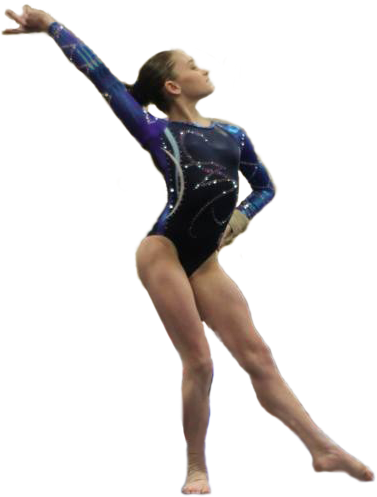 I am a 15 year old Training Level 10 gymnast at San Mateo Gymnastics in Belmont, CA. My coaches are Armen Astoian, Andrew Pileggi and Erin Thomas. I train 25 hours a week (6 days/4hours a day, plus 1 hour on Sundays). I also maintained a 3.62 GPA in Junior High. I now attend Carlmont High School in Belmont, CA. I just got accepted into the Biotechnology program at my school for students that excel in Science and Math. Besides being a gymnast and student I am an artist as well. I live to compete and show off all my hard work! I started gymnastics the week before I turned 6 years old. I was always tiny and muscular so my mom thought gymnastics would be good for me. I started out at Monarchs Gymnastics in Newbury Park, CA in a rec class and within a few weeks the coach told my mom that I was a natural and wanted me to move to their Pre-Team. Unfortunately we found out earlier that week we were moving to Chico, in Northern California. My coach made my mom promise to find me a new gym there. I ended up at a gym in Oroville, CA in an advanced class and within a couple of months was moved to team. I wasn't a great Level 4 but I worked hard and kept improving gradually. Half way through Level 5 things started to click for me and I started placing well on at least 2 events and the All Around. At Level 5 State I came in 3rd Place on Vault, 7th Place on Beam and 6th Place All Around in the Youngest age division. Level 6 started out great for me at Judge's Cup where I won the All Around. I came in 2nd on Vault, 3rd on Bars, 1st on Beam(9.6) and 4th on Floor. At my next meet the Gypsy Invite I placed 1st on Bars, Beam, Floor and the All Around. At Level 6 State I was super sick but still gave it my all. I placed 4th on Beam, 7th on Vault and 10th in the All Around in the youngest age division. After this meet I was so sick we headed straight for the ER because of intense stomach pain so I was happy I got through that meet! After that season we decided to move to a different gym. I finished my Level 7 season strong at State. I scored a 9.45 on Vault(3rd), 9.475 on Beam(5th), 9.5 on Floor and a 37.55 All Around(8th). Unfortunately my coach moved to a different gym so we followed him but now our commute was almost 2 hours each way 5 days a week. I was now at Byers Roseville. This was a tough season for me due to my first bout with Severs Disease. I started my Level 8 season coming in 2nd on Vault and Floor and 4th All Around. At Level 8 State that year despite my Severs I ended up 7th on Bars, 8th on Beam, 5th on Floor and 8th in the All Around with a 36.575. Regionals was so tough that year because I could barely walk by then because of how severe my Severs had become at that point and my Nana who came to watch me compete broke the news to me that she was terminal with cancer. I pushed through and came in 19th Place. Shortly after finishing this season I found out we were moving again but this time to the Bay Area. I started at San Mateo Gymnastics in Belmont, CA. My coaches are Armen Astoian and Oksana Bystrova. My coaches decided that since I was only 12 years old they would have me do Level 8 again. At my first meet Golden State Classic I got a 9.525(2nd) on Vault and 4th All Around with a 36.875. My best meet of the season was at the WOGA Classic. I was the Floor(9.7) and Bars(9.6) Champion and came in 3rd on Vault and 4th on Beam and 2nd Place All Around with a 37.425. At the Byers Classic a few days after my Nana passed away and the first meet of mine that my mom has ever missed I decided to dedicate this meet to my Nana. I came in 1st on Vault and had my highest beam score of the season(9.5) and got a 9.425 on Floor. At the Delta Classic I got 1st Place on Vault and Floor and came in 3rd Place All Around. During this season I had a huge growth spurt(for me). I had been 4'7" forever but I grew over 2" in a couple of months so it was starting to affect my body. 2 weeks before State I ended up partially tearing my hamstring and one of my wrists was hurting really bad. I went to an amazing physical therapist but I wasn't able to compete at the State meet that year.. This was so hard because I had never missed a meet before and not only do I love competing but I live to compete at State. I was able to heal enough to compete 3 events at Regionals(no vault). Considering my practice time was really cut down due to my injuries I did ok at this meet and my Pop-Pop came to cheer me on. I got a 9.275(11th) on Bars, an 8.8 on Beam(with a fall), and a 9.25 on Floor. After we got back from this meet we had my wrist X-rayed and we found out it was a healing fracture. So it was definitely for the best that I didn't compete Vault at Regionals. I was proud of myself for trying my hardest despite my injuries. It is just part of this sport. As it turned out since I had a fractured wrist I couldn't do any weight bearing activity for 2 months. My coaches and I wanted me to do Level 9 but with having to reduce training we ended up deciding that I should do Level 8 but with all upgraded skills. Since the cycle had changed I could now do what used to be Level 9 skills as well. So on bars I ended up doing a double back dismount and on beam I did back tucks and a gainer half-dismount. Well I ended up having another growth spurt so I was now 4'10" and my feet grew a whole size in 1 month so now my Severs came back again at the beginning of the season. My coaches decided to have me not do vault for the first 3 meets of the season. I love being an All Around gymnast so this was tough but it paid off for the rest of the season. My first meet back as an All Arounder was the 2014 AOGC Gymnastics Legends Meet. I got a 9.375 on Bars(4th), 9.5 on Beam(2nd), 9.3 on Floor(3rd) and a 37.125 All Around(3rd). At the next meet Spirit of the Flame I won Vault(9.45) and Floor(9.475) and got a 9.35 on Bars(3rd) and 37.075 All Around(2nd). The next meet was State and I was so excited to show my coaches how much I love competing at State and showing off all my hard work. I was the All Around(37.925) and Floor(9.65) State Champion, I came in 2nd on Beam(9.45), 3rd on Bars(9.525) and 4th on Vault(9.3). My All Around score was the 5th highest of all the Level 8s at State and of all the Level 8-10s my score was the 10th highest at State. 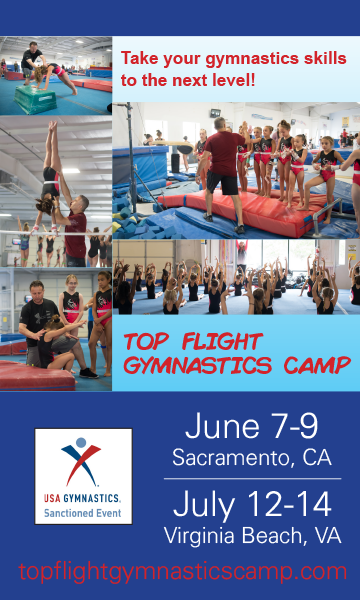 I was a Level 8 State Team Member and qualified to a special session of the top 12 gymnasts from each of the 5 States to compete at Regionals in Disneyland. At Regionals I got my highest ever All Around score of a 38.0(3rd Place). My scores were Vault-9.475(6th), Bars-9.6(3rd), Beam-9.4(5th) and Floor-9.525(4th). So I won the Bronze medal for both All Around and Bars and my NorCal Team came in 3rd as well. I was so happy that I got to contribute to us winning that Bronze medal! Since Regionals I have been working hard on my Level 9 skills and am now busy perfecting them. I can't wait until January so I can show off all of my hard work. I love to compete!!! Even though I have battled through some injuries due to growth I hope I can be inspirational to other gymnasts to keep pushing through and never giving up or quitting. I know I was born to be a gymnast! Competing Level 9 this past season had some challenges but defintely taught me how tough I am. At the beginning of the season I pulled my hip flexor in PE at school and ended up only competing bars for the first 3 meets. During those meets, I came in 6th Place, 1st Place(9.475) and 2nd Place(9.425) on Bars as a first year Level 9. My first All Around Meet was at Metroplex in TX and I came in 1st on Bars, 5th on Beam and 5th in the All Around. My next All Around Meet was the San Mateo Gymmnastics Home Meet and I had my highest All Around score of the season. I got a 9.15 on Vault(3rd), 9.425 on Bars(2nd), 5th on Beam with a fall, 4th on Floor and 4th All Around(35.925). My next meet was the AOGC Legends meet where I competed a backhandspring-backlayout and a straddle jump-back tuck connected for the first time. I stuck both and got a 9.025. Unfortunately the week of that meet my grips tore and I had to get a new pair and they weren't broken in yet so I slipped on bars and fell otherwise I know I would have done well on bars again. As luck would have it I badly sprained my ankle a couple weeks out from State. I could have petitioned into Regionals since I had scores to qualify me to do so but instead since we only had a 3 person Level 9 Team I decided to go for it at State and give us a shot at winning the State title. My practice time was really cut back to heal my ankle. I did acupuncture and went to the chiropractor. At State all my routines were watered down to save my ankle. I only competed 1 vault and on bars I got a 9.325(6th), beam I fell and floor while watered down was actually pretty solid. My scores helped our Level 9 Team be the 5th Place Team out of 34 Teams in NorCal and gave us the 2 points to help my gym tie for 1st Place in NorCal for top gym of the year. I felt proud that I pushed through the pain and could contribute to my team San Mateo Gymnastics. My ankle was really bothering me after this and I grew about 2.25" that month so that didn't help but I still wanted to try to give it my all at Regionals since I qualified. Regionals started out great on Vault with a 9.225(my highest score of the season) but then I fell on my double back on bars, then on beam not only did I fall on my back handspring-backlayout(luckily my feet touched first) but I slammed my face into the beam on my straddle jump-back tuck. One of the judges jumped out of her seat. I actually felt bad for scaring her. I was going to get back up and do my dismount despite having tears in my eyes from the pain of smacking my jaw into the beam but my coach told me to be done and just salute. I iced my face for awhile while waiting to warm up Floor. I know plenty of girls that would have scratched floor after that horrific beam but I love showing off my Floor routine and nothing was going to stop me! My family didn't know if I would compete floor but I was determined. I am not saying I had the best tumbling of the season but I truly showed off that routine all while smiling for those judges. I bet that beam judge would be shocked to know I actually competed Floor. Obviously I was proud of myself but my parents and coaches were so impressed with how tough I was. That obviously made a very bad day feel not so bad :) So while my Level 9 season didn't go as I planned it did teach me a lot about myself. I live to compete and I am tough and am willing to do whatever it takes for my team. I am currently training Level 10 and and am praying that I am just about done growing and that I can spend the next 3 years showing college coaches that this sport isn't just a sport to me it is a part of who I am. My goal is to compete gymnastics at a Division 1 college(with a full ride scholarship) that has a Biotechnology, Bioengineering and/or a great Art program. I thrive during competition season and I know in college you are constantly competing to earn a spot to represent your team in meets. Working with a group of girls to be the best team truly motivates me and then getting a degree in a field I am passionate about would be amazing. 2015 Level 9 Regional Qualifier despite having a badly sprained ankle. I didn't petition into Regionals but went for it at State since we only had a 3 person Level 9 team. I wanted to give us a shot to win Level 9 State Team. I only competed one vault to save my ankle and also competed the other 3 events and we came in 5th Place out of 34 Teams with all our scores counting. The 2 points we earned for that placing helped San Mateo Gymnastics be the #1 Team in NorCal for the 2015 season so I am glad I pushed through the pain. 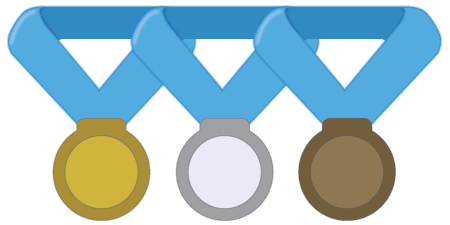 Vault- Tsuk Piked and Laid Out, Front Handspring Front Tuck, Front Handspring Front Pike Half. Bars- Giants, Clear Hip to Handstand to Double Back Dismount,Overshoot, Double Back Dismount, Pirouette on high and low bar, Toe Shoot, Toe hands to handstand with pirouette, front Giants and working Jaegers, Double Pike Dismounts, working blind changes. Beam- One Armed Front Handspring-Back Tuck, Straddle Jump-Back Tuck, Switch Leap-Back Tuck, Back Handspring-Back Layout, Gainer-Half Dismount, Gainer-Full Dismount, Switch Leap-Scissone Ring, Switch Leap-Straddle Quarter, working Side Aerial, One Armed Front Handspring-Straddle Jump. Floor-Switch Leap, Popa, 1.5 Punch Front, Front Layout-Front Full, working Front Layout- Rudi, Working Layout Double Twist. Front Layout-Front Layout , Front Handspring-Front Layout-Front Layout, Double Full Turn, Switch Leap- Tour Jete, Double Back, working double pike and double layout, wolf full, Front Full-Front Tuck, Front Full-Front Pike. * All of these skills I either already have or am working. Gymnastics of course and everything related to Art. I love to draw, paint, sew, sculpt, design and build things. Biotechnology- learning the science and math behind things. One of my favorite shows is: How It's Made. I have been to Kenya and went on safari. My Dad is the son of missionary parents and grew up there so he wanted me to see where he lived as a kid. My family also visited Feed the Children and New Life Home in Nairobi so we could understand the conditions these children live in and to better appreciate our lives here in the United States. Last Summer I attended Camp Couture camp that is owned by one of the final contestants of Project Runway last year. I learned how to sew and now use the sewing machine i inherited from my Nana to make some of my own clothes. Last Summer I flew by myself to visit my Pop-Pop in North Carolina and went zip-lining, it was amazing! I also model leotards for Destira Leotards. Since I am 5' 1 and probably won't get much taller I am pretty sure it is my only opportunity to be a model!!! One day I hope to design leotards myself. Not that the topic is fun but I am on the cover of my Mom's published book with my Nana and sister called Proactive Legacy. The book is about my family battling cancer and the BRCA2 gene. I lost my Nana but I am always trying to make her proud!